Welcome to May 2013 issue of GL Communications' Newsletter providing information and insight into our Short Message Service (SMS) Testing Solutions. Short Message Service (SMS) is a text messaging service available through a mobile phone, web, or other wireless communication systems, using standardized communications protocols that allow the exchange of short text messages between two subscribers. 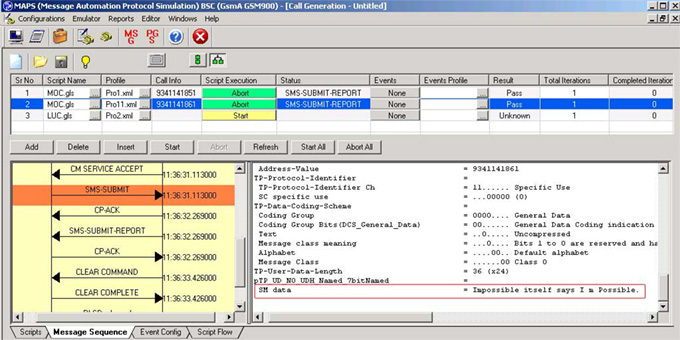 Most SMS messages are mobile-to-mobile text messages, however the standard supports other types of broadcast messaging as well. 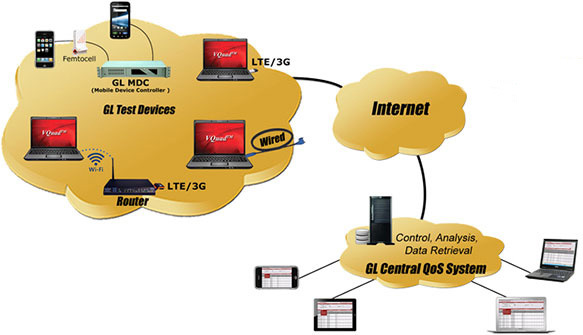 GL offers solutions that test the service end-to-end from smart phone to smart phone, as well as, from within the wireless infrastructure. In testing end to end, a "smartphone app" is commanded to send or receive SMS messages and record results such as pass or fail. These results are conveyed to a database that can be easily accessed by any browser. When testing from within the wireless infrastructure, thousands to millions of messages can be sent to thousands to millions of mobile phones in a simulated environment to load test or verify / validate the SMS protocol. Additional details are provided below. Our multi-purpose emulation platform called MAPS™ (Message Automation and Protocol Simulation) has the ability to push / pull Short Messages over the network as if sent by thousands of mobile phones (Short Message Mobile Originated (SMS-MO)). MAPS™ can also transmit a Short Message to a mobile phone (Short Message Mobile Terminated (SMS-MT)). The short message service testing is available on the GSM, UMTS, and MAP interfaces. 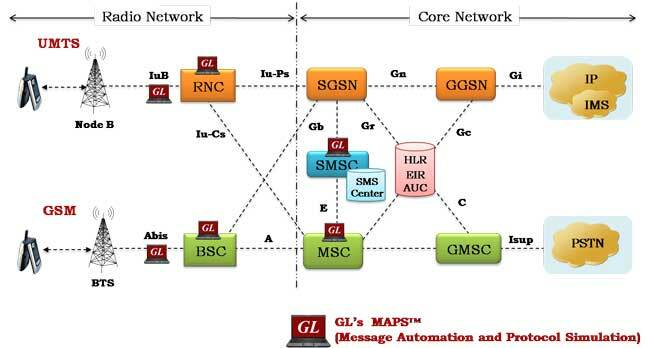 As shown in the above picture, GL offers MAPS™ application that facilitates Short Message Service (SMS) delivery across various network interfaces such as GSM A, GSM Abis, GSM A over IP, MAP over IP, UMTS IuCS, and UMTS IuH and more. GL's MAPS™ (Message Automation & Protocol Simulation) is an advanced and versatile protocol simulator/tester that can simulate a variety of protocols encountered in the telecom space. 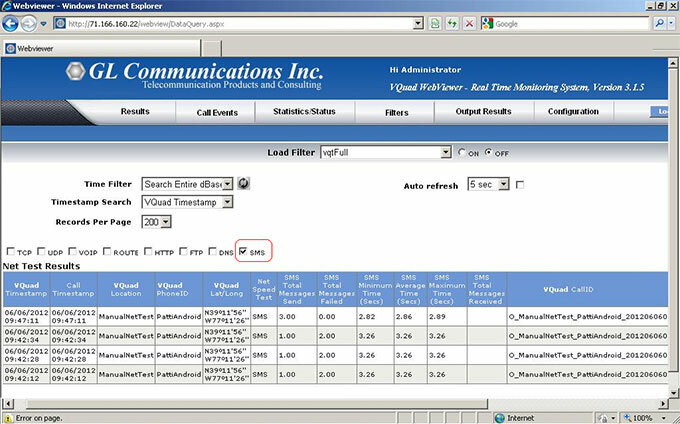 In addition to simulating network elements and connected interfaces, it also supports error tracking, regression testing, conformance testing, load testing, and call generation. It can run pre-defined test scenarios against test objects in a controlled & deterministic manner. GL's VQuad™ in conjunction with Mobile Device Controller application and "mobile apps" installed on smartphones supports SMS testing on Smartphones (iPhone and Android). VQuad™ can remotely command specific SMS tests on mobile devices from any part of the world. While testing mobile devices, VQuad™ remotely accesses Android/Apple iPhone/Tablet devices for initiating the test and retrieving the results. Both automated remote testing and manual testing are available on the mobile device using Android or Apple apps that are available freely for download. SMS test statistics are available for Mobile devices as well as the Wired Internet connection of the PC (Wired, WiFi, Broadband (3G or 4G), LTE). All test results (NetTest related Statistics, and Result View) are automatically relayed to a Central Database where they are accessed via a simple WEB Browser/Viewer - WebViewer™. For comprehensive information, please visit our Short Message Service (SMS) Testing Solutions web page.